Before we begin the actual make-up application there is a little preparation that will need to be done with the crepe hair. It should resemble a braid when you receive it. 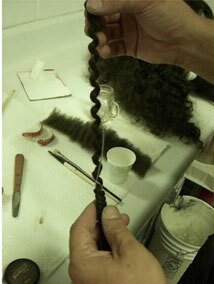 Carefully pull the hair out of the braid revealing two pieces of string that the crepe hair was wrapped around. Once the whole amount is unraveled you can discard the string as you will not be needing it again. If you were to attempt applying the hair at this point it would be super frizzy and curly. This, in some occasions, may be the finish you are looking for. For the sake of this make-up however we want to straighten the hair out. There are many ways to straighten crepe hair. You can iron it under a cloth using plenty of steam, use a steamer etc. For this example however I am going to demonstrate probably the easiest and cheapest way. 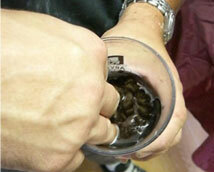 Select a glass or cup that is strong and does not have any handles etc on the sides. Fill the glass with some water and dunk in your crepe hair. 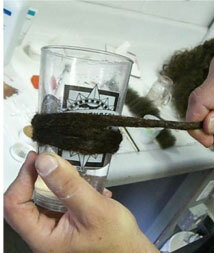 Remove the hair, ring it out and begin wrapping it as tightly as you can around the outside of the glass. You can tuck the end under one of the loops of hair running around the glass to keep it in place. Leave this hair overnight if possible, if not at least an hour or so to straighten out. 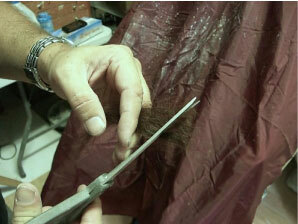 If you cannot leave it long enough to dry on it's own you will need to dry it with a hairdryer or something like that. 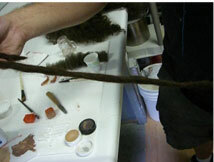 Once the hair is unwound it will be straight and ready to apply. 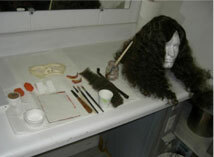 Any unused hair can be placed in a ziplock bag or container for use at a later date. Make sure that all of your materials and tools are laid out on a clean, hygienic surface and in an easy to reach manner. 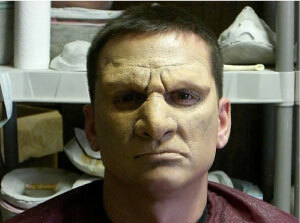 Here is our model without any make-up. After determining the placement of your piece apply a small amount of glue to the center of where it will sit, in this case the nose. Place the appliance on firmly and evenly. 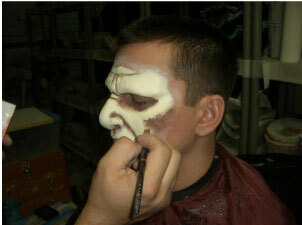 If you place it incorrectly, a little alcohol on a q-tip or brush can remove the prosthetic. Wait for the alcohol to evaporate and reapply. The glue will still be sticky once the alcohol dries. Peel the piece down gently (just until you can see the area that is glued). 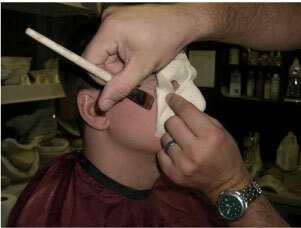 Apply the glue from the area that is already secured in an outwardsfashion and gently lay the prosthetic back down onto the glue. Do this same thing on the other side and slowly and evenly do the same around the top and bottom as well until the entire piece is glued down. 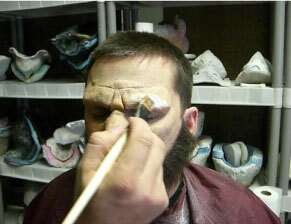 Carefully go in around the eyes and ensure they are glued down. Carefully go around all your edges with the glue making sure you apply it in an outward direction so as not to fold your edge over or wrinkle it. Using a foam latex wedge cover the entire surface of the foam with a thin, even layer of Pros-aide (or Pro Adhesive/ Beta Bond) glue. 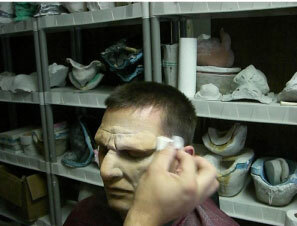 This will seal the surface and prevent the make-up from absorbing into the prosthetic. Using a Q-tip dipped in alcohol (not too wet..you do not want it running into their eyes etc) work around the edge and fix any small wrinkles, folded edges etc that may be needed to make you edge look as perfectly blended into the skin as possible. Powder the entire area that had the glue applied. This will stop it being sticky. This is when your model may open their eyes again, just be sure to brush away any excess powder before they do so it does not go in their eyes. Add a little of the chocolate and flesh rmg's to your palette. Mix them together to a dark fleshtone. 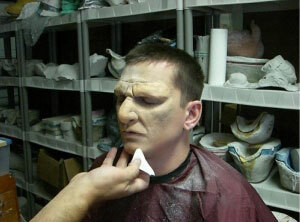 Also shadow under the cheekbones and onto the skin. 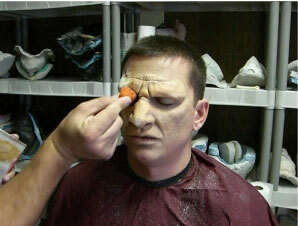 With the straight Flesh rmg on an orange stipple sponge, begin covering the entire face in a dabbing (stippling) motion. 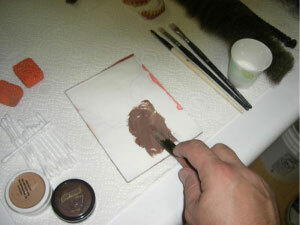 Never drag or smear as it creates unnatural textures in the color. Make sure to not press too hard that it totally fills any creases etc as you want a little of the darker color to show through. 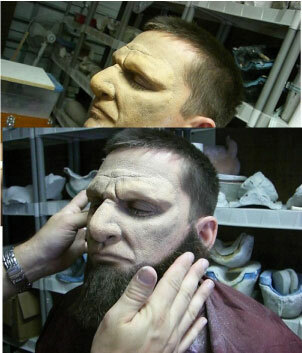 Here is our face covered in the flesh. 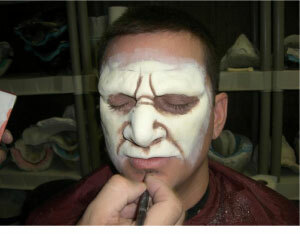 With a latex sponge, apply a light coating of powder to the entire face. 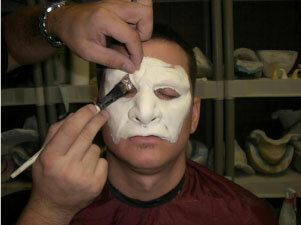 This is to set the greasepaint we just applied. Put a small amount of ky jelly onto your palette. 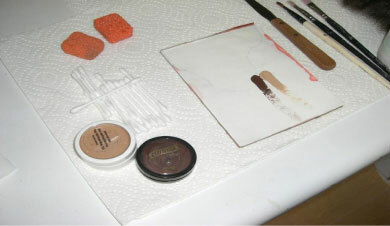 Lightly wipe the KY over the powder to reactivate the color and remover any powderiness to the face. 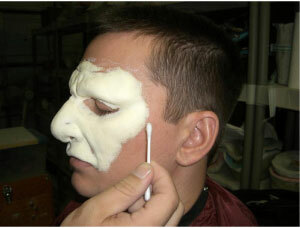 Apply a thin, even coating of prosaide along the jawline and under the bottom lip. 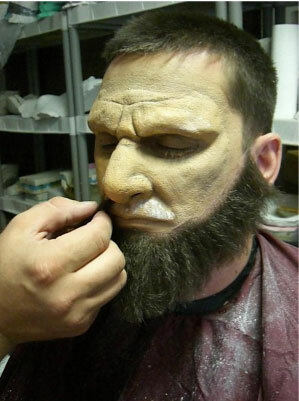 Allow the glue to dry (it will dry clear and super sticky) and then press the beard into place. You want to make sure the glue is dry before attempting and kind of hair work as this is when it is most sticky and you will get better results. ...and to the brows where the eyebrows will be. Pull off a small amount of the prepared crepe hair and cut it on an angle. 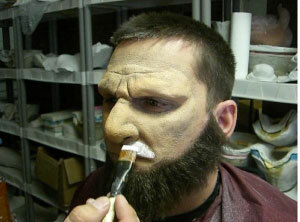 This is going to be the moustache and the angle you cut it on will determine how it appears to grow out of the face. 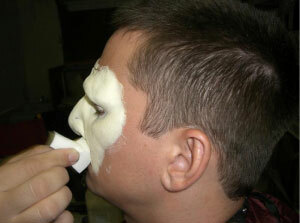 Gently lay the cut tips into the glue with the point closest to the nose. 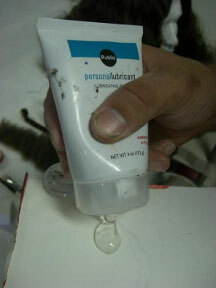 DO NOT press the whole clump of hair into the glue or it will look very fake. 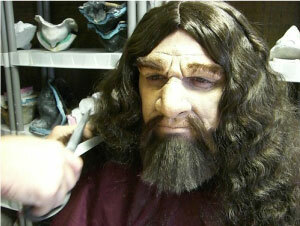 You want to hair to appear to grow out of the skin. 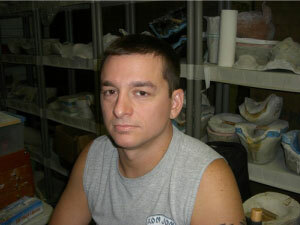 Once you have the desired density of hair, you can trim it to how you want it. 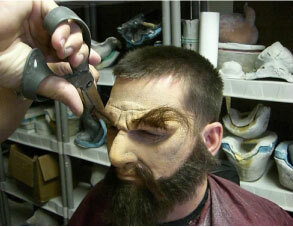 Again follow the above steps to apply the hair for the eyebrows and of course trim them down (unless you like the super bushy look). 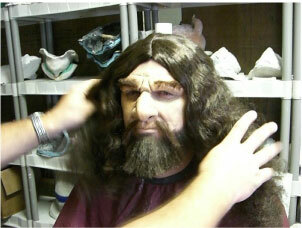 Put on the wig and find the correct placement. You may need some pins to keep it in place. 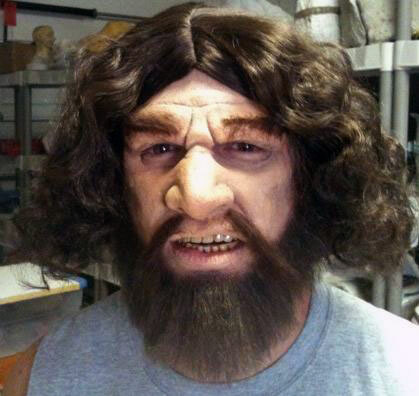 If you desire, you can trim the hair to whatever length you desire for your caveman. And there you have it. 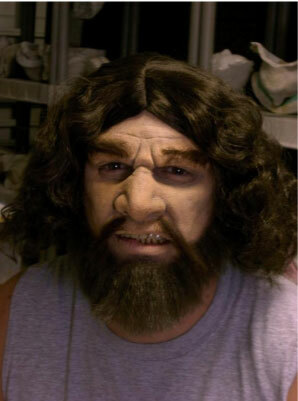 One completed Caveman make-up.